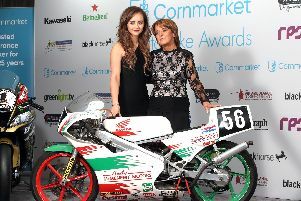 William Dunlop's partner Janine Brolly and mother Louise pictured the Cornmarket Motorbike Awards on Friday. William Dunlop was posthumously inducted into the Hall of Fame at the Cornmarket Motorbike Awards in Belfast. His mother Louise and partner Janine Brolly accepted the accolade on his behalf as they were interviewed on stage by BBC NI's Stephen Watson. At the Cornmarket Motorbike Awards at the Crown Plaza Hotel in Belfast on Friday night, Janine revealed that she hoped to establish the William Dunlop Foundation in William’s memory, with the aim of supporting children who have suffered the loss of a parent. Janine said: “It’s a real honour to be here tonight. The legacy that William has left as a sportsperson and the way that he is thought of is due to the person behind the visor. “He was so special and he is missed so much and the legacy he has left is tremendous; I now have the privilege of raising his two greatest legacies (daughters Ella, 2 and Willa Wren, who was born in September). Janine Brolly and Louise Dunlop with World Superbike champion Jonathan Rea, who was crowned the Irish Motorcyclist of the Year at the Cornmarket Motorbike Awards. “I know that William’s number one priority and his number one life goal was to be a father. He was such a tremendous daddy and his main concern would be the welfare of his children,” added Janine, who outlined her intention to set up the William Dunlop Foundation. “After William’s accident, the support that we received as a family… I don’t think people will fully understand how vital that help was at the time and how much I truly appreciate it. “From that, I was thinking that as Ella and Willa’s mum, my job is to fix things but unfortunately I can’t fix this for them because they have lost their daddy. “As tremendous as William was and the legacy that he left, they are missing out on a life with him and unfortunately that is the position that a lot of children find themselves in, but they maybe don’t have the motorcycle community to support them,” she said. Ballymoney man William Dunlop was killed in a crash at the Skerries 100 in July 2018. William’s mum Louise said her son was a ‘very special’ person who could be likened to his uncle Joey. “William was so quiet and I think that was maybe why people took to William, maybe even more so than Michael even,” said Louise. “They are two very different boys and William was very special, he was quite like his uncle Joey because he never said very much. Michael is quite like his dad – boisterous – but nonetheless we are proud of all our boys. Paying tribute to the Dunlop family, Louise added that Michael would have their full support if he decides to race on this year. “What can you say, you just have to keep going on. We’ve lost Robert and we’ve lost William but we never really saw them down about anything, they just kept on racing and it’s a credit to them and the strength of the whole Dunlop family,” she said.